Carlos Saura’s (Carmen, Blood Wedding) touching and thought-provoking 1976 work remains one of the most important films in Spanish cinema. Released when Spain was just coming out of 40 years of Fascist rule it was nominated for a Golden Globe, and won the Grand Prize at Cannes in 1977. 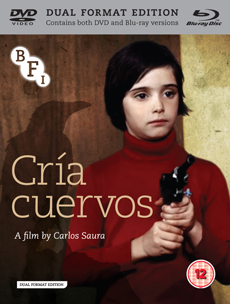 Cría cuervos (English translation: Raise Ravens) centres on an amazing performance by the young actress Ana Torrent (Spirit Of The Beehive, The Haunting) as the disturbed eight-year-old girl living in Madrid with her two sisters and mourning the death of her mother, played by an ethereal Geraldine Chaplin, whom she conjures as a ghost. “A masterpiece of form and technique, and Chaplin and Torrent are both outstanding” – ***** Peter Bradshaw, Guardian.